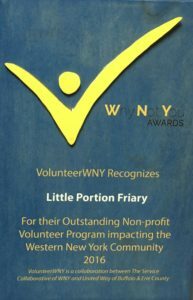 For the months of November and December the Little Portion friary server 46 and 55 guests respectively. In November we served 33 male and 13 females guests. In December we served 46 male and 12 females guests. Of these guest 2 were veterans in both November and December. Without the help of volunteers such as cooks who offer their time, talents and sometimes their own food we would not be able to feed the homeless a breakfast and a warm meal at night. Many volunteers made a difference in the lives of the homeless this month. These included handmade blankets from high schools. Volunteers who really extended themselves working on Christmas Eve and Christmas day. We should all be thankful for the many people we have in our lives. Many of the homeless at little portion friary were not as fortunate and were limited to the volunteers who extended themselves to serve at the Friary this Christmas. One volunteer who made a difference this month was Collette. 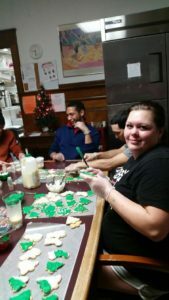 She brought her homemade cookies in with homemade frosting and other cookie decorations. Each guest decorated their cookies. Some said they were going to take these to their children. We hope and pray some relationships were mended through her efforts. Below are some pictures of the occasion. We continue to correct the outdoor lighting situation or lack of this month. The front of the friary is now very well lit with a LED which completely illuminates the front lawn. LED flood lights with dusk to dawn sensors have been installed in the back of the friary. We are now down to 2 portions of the friary not lit at night. We hope to complete these the first part of next year. For the month of September, the Friary doors were once again opened to the homeless. We started at 9:00 AM on September 10th, and by 1:00 PM we were full! Your donations have helped 29 men and 14 women this month who were much less fortunate. Without our volunteer staff and donations by others, these 43 souls would have been on the streets in September. 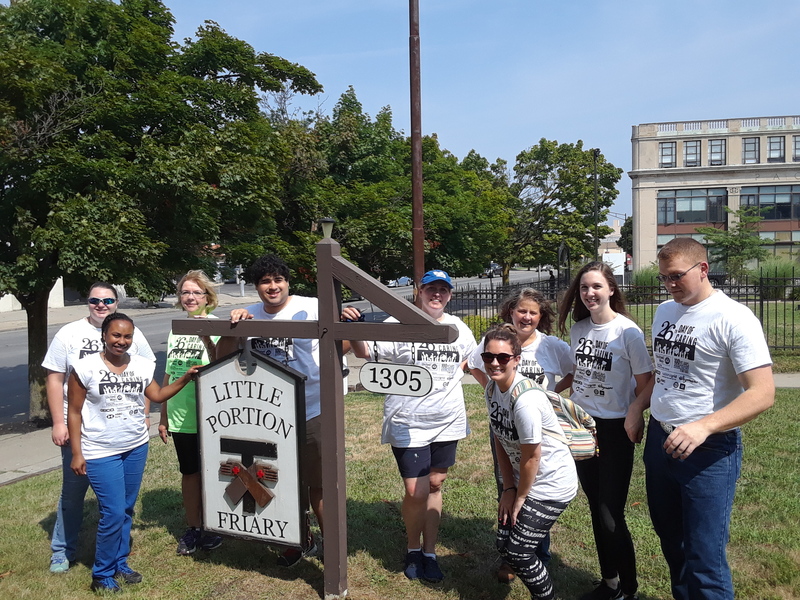 Volunteers are greatly needed, and donations are essential for the Friary to stay open. A safety concern was risen by a volunteer after bikes were stolen from the friary. Some of the outside lighting did not work. Several of the bulbs used outside are being phased out, and they are not easy to find. We were able to locate these bulbs, and purchase them for a fraction of the cost since they were on clearance! All of the dead blubs have been replaced, a halogen light was installed to light the bike lockup, and a LED light was installed at the entry. Thank you Lord. Also, a big thanks goes out to the volunteers who purchased and installed the new lights. For now our main focus is replacing bulbs and updating the system when possible. For the long term, we would like to replace these with LED lights which have a higher upfront cost but are more efficient to run. Thomann asphalt and paving has offered to repave the friary’s parking lot. This would not have been possible considering the limited finances of little portion friary. We are thankful for this generous offer and will keep all beneficiaries and volunteers in our prayers. During the month of August, we were closed for much needed cleaning and repairs. 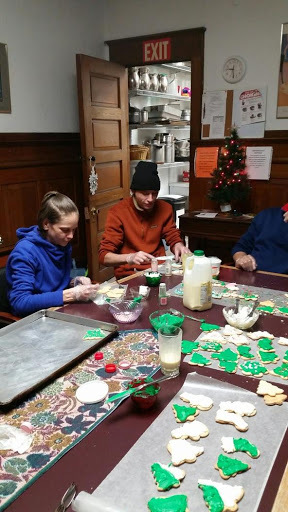 In addition to carpet shampooing by Ron Karwik and Chris Cammarano, freezer and kitchen cleaning by Sr. Barbara and friends, curtain cleaning, ironing and hanging by Ann Hulbert and friends and many signs made and upgraded by Barb, we had four groups help. 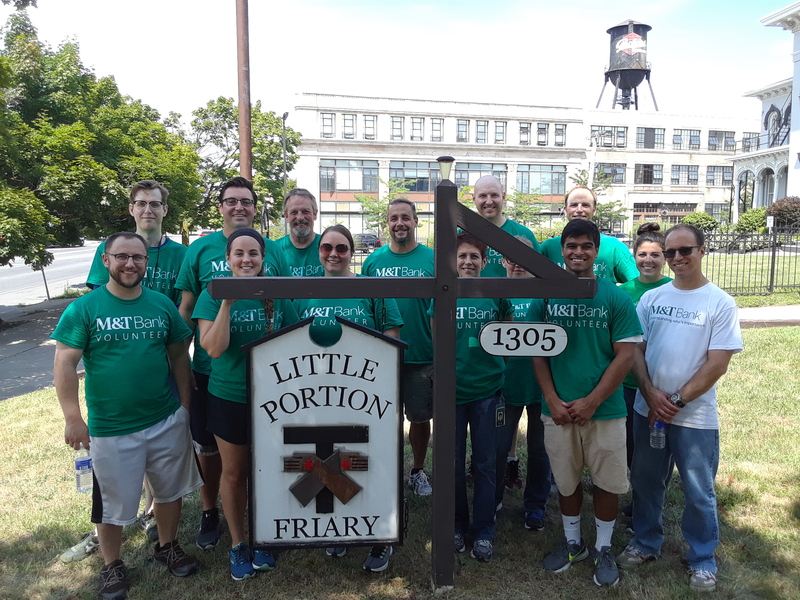 In the first week, two 12 member groups from M&T Bank did the initial cleaning of 16 bedrooms, hallways, bathrooms, the kitchen, the front office, cut the grass, trimmed hedges and more. 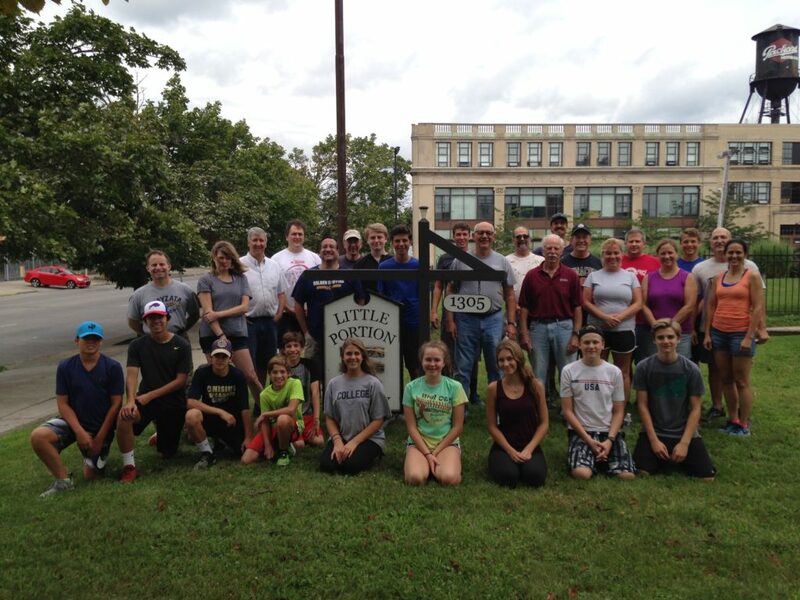 For the 12th consecutive year, the NYSDOT sent volunteers on the United Way Day of Caring. About 11 came and painted the black iron gates on the driveway, did extensive grounds keeping, started repair of the 1st floor men’s bathroom ceiling (installed the replacement ceiling board), cleaned baseboard heating units, painted the shed and back door and frame, built a shelf for the dirty linen container closet. They were assisted by 9 volunteers from Watts Architecture and Engineering firm. 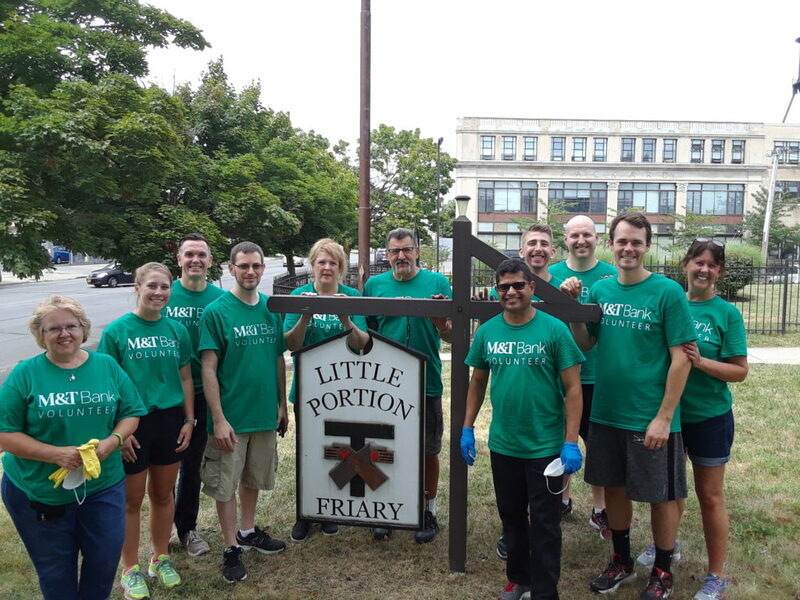 On August 18th, for maybe the 6th year, 20 folks from St. Mary’s Parish in Swormville came. They painted the women’s bathroom metal dividers, continued the repair of the men’s bathroom ceiling (plastering around the new board), identified unusable vacuum cleaner supplies and cleaned and repaired vacuums, caulked around showers, painted the front office, cleaned and flushed roof gutters and downspouts, blew out all dryer vent hoses, checked all lights and replaced bulbs, checked and tightened all loose furniture parts, did touch-up painting of baseboards and door frames and miscellaneous cleaning. This photo is from 2017 but a lot of the same people came. 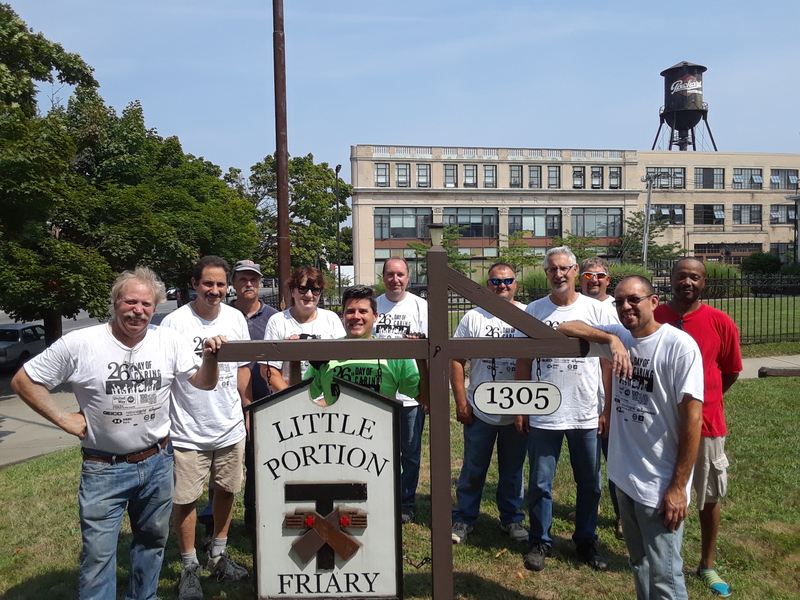 At the end of the month, 5 members of the Erie County Sheriff’s Service Action Corps came on three separate days to finish up projects. They primed and painted the new bathroom ceiling, replaced a worn entrance stair and supports, cut and trimmed the grass, finished cleaning the men’s bathrooms, scrubbed all the tile floors, did touch-up painting, and moved a lot of furniture back. For the months of April, May, and June the friary has been running smooth thanks to God’s help. There has been the occasional guest asked to leave but there have been many success stories. One success story is Ryan, he came to the friary with a dependency (i.e. alcohol, drugs, gambling…). Most of our guests have a dependency and while at the friary they struggle to lose this. They know they must not be using while at the friary or they risk losing their bed. Now back to Ryan, I was walking through my neighborhood which God alone has allowed me to live in. It’s in an affluent area in Clarence. As I was walked my grandchildren to a park a person working on a house waved to me and I waved back. After playing at the park we returned passing the house. This time the fellow came out and greeted me. It was Ryan, He was installing hardwood floors in the house. He told me, he is still struggling but with God’s help, he is making it each day. He has faith, he has an apartment, he has a car, he has a job, but the greatest of these is his faith. This faith will carry him as it should carry us through the difficult times. On parting, he told me God is good and my reply as all of ours should be is “ALL THE TIME”. I thank God he has allowed me to see Ryan to affirm my faith and I hope this short letter affirms your faith that God is helping through his works at the friary. Your donations the past months have helped men and women who are much less fortunate. Without our volunteer staff and donations from others, these souls would have been on the streets. Volunteers are greatly needed and donations are essential for the Friary to stay open. For the month of March, we had a surprise plumbing bill which really humbled us. The main sewer pipe from the friary to the street was plugged or crushed. The plumbers were called and after approximately 14 hours they once again had the water running. Think of it, you have 29 guests at your house and no water! You must ask them to go elsewhere if they need to use water! The dishes piled up, the laundry was halted, no showers, no water use through that evening and night! Yes, this started in the afternoon. So the next morning the volunteers were doing dishes and laundry for what seemed an unending task! We were humbled but we also were allowed to serve those in much greater need than us. We continue to make the most of each donation through optimizing our phone, TV and cable plans. We have moved off cable TV and phone service and are now down to a minimum internet service. Our female engineer still wishes to optimize this solution further! She currently has reduced the monthly bill from a business service phone, TV, and internet costing $200/Mo down to a $50/mo bill. She wants to achieve a $15/Mo plan in the hopes of making each donation count. For March your donations have helped 47 men and 18 women who were much less fortunate. Without our volunteer staff and donations by others, these 65 souls would have been on the streets in March. Volunteers are greatly needed and donations are essential for the Friary to stay open. This appears to be a repeat of last month! The end of the month brought us a foot of snow in Buffalo I’m warm, the 29 Guests currently staying at Little Portion Friary (LPF) are also warm thanks to your donations, volunteers staffing LPF and guests being tentative to their plan. We continue to make the most of each donation through optimizing our phone, TV and cable plans. We moved off cable TV last month and are using a free space antenna and TV both donated by our benefactors, who we continue to pray for. This month we started the migration from a cable phone service to a Voice over IP system. The device and supporting equipment was donated and to show God’s immense grace the engineer who donated the device provided her services to configure and install this device. For the month of February, your donations have helped 47 men and 22 women who were much less fortunate. Without our volunteer staff and donations by others, these 69 souls would have been on the streets in February. Volunteers are greatly needed and donations are essential for us to stay open. As I write this article there is snow falling outside and I’m in a warm house. There are many not as fortunate as I. For the month of January your donations have helped 40 men and 25 women who were much less fortunate. Without our volunteer staff and donations by others, these 65 souls would have been on the streets in January. Volunteers and donations are essential for us to stay open. 2 good quality antennas and all supporting “glue” required make the system operational. The transition away from cable was a bumpy ride. Initially, we had the old CRT TVs on the men’s and women’s side each requiring converter boxes (donated thank you Lord). One converter initially used on the women’s side, failed after a short time. A benefactor stepped forward and donated an HD TV for the women’s side and we were up and running again. We were ready to insert the second donated converter box on the men’s side for their CRT TV when a second benefactor stepped forward and donated an HD TV! God’s grace is amazing and never outdone as we have seen numerous tune at the little portion friary. We pray for our benefactors that God ‘s grace be poured out upon them. I work the evening shifts and remind the guests as they turn on the TV to pray for those who have donated. Finally being off cable TV reduces our operational costs hence makes your donations more effective.